I've had this on vinyl since '62 or '63. I've loved it all this time. It's way outside the usual trad envelope, but I don't care. This is one of those wonderful landlocked things that straddles the line between vintage surf and vintage if-it's-got-no-words-it's-surf. Jim Waller & his pesky cohorts were from California's Central Valley, Fresno, to be exact. Tony Hilder transformed them into the sounds here just for this record. Their music was heavily piano / organ / sax oriented R&B / lounge jazz based. Some of their work reminds me a bit of Perez Prado. The sounds on this album are structured around the dance called The Soul that was born of the Pachuko Soul sub-genre of surf played by Latino bands like the Soul Kings, the Charades, and the Rhythm Kings, but with a little less Ray Barretto and a lot more Jimmy Smith. Jim Waller released a jazz album in the early seventies, so that tells you where their hearts were. Besides Jim Waller - piano, organ, and rhythm guitar, the Deltas were Terry Christofferson - lead guitar, Roy Carlson - various horns, Eddie Atkinson - bass, and Jeff Christensen - drums. There are a couple of really cool things here. For one, the jazz guitar version of Latin'ia is the best version ever, next to the Sentinals' original. For another, their jazz edged rendition of the Rhythm Kings / Sentinals Exotic is nothing if not inspired. They were a bit like taking the whole surf idiom, and inverting it. The sounds here are closer to Galaxy Records act the Merced Blue Notes than surf. The Merced Blue Notes, whose Whole Lotta Nothin', Rufus Jr., and Mama Rufus graced the black playlists at KDIA and KSAN (am) in the Bay Area, featured a very young Gregg Ellmore and Gary Grubb (Duncan) before they launched the Brogues, and ended up in Quicksilver Messenger Service. That's a bit of an aside, but they are from the same Latin Jazz R&B Central Valley crucible. Jim Waller played in various jazz line ups in the early 70s. One last note. Many surf movies were accompanied by jazz, either from phonographs at showings, or later on their soundtracks. This music would have fit right in. This was a single for the Deltas. It is very Hammond oriented, and quite a melodic jazz combo number. It's interesting to here Jim Waller's luau lounge interpretation of the Mariachi arrangement of this Pachuko Soul classic. It's very cool, and when compared to modern, or even vintage lounge, it's unsurpassed in campy cheese wonderment. A very enjoyable fun track, with wood blocks banging away, and a real Central Valley swing going. Piano oriented jazz number that is very interesting and infectious. In the old days, I used to think the title didn't match the song very well, but as time has crept up on me, it has become a much better fit. There was a significant influence from West Coast jazz in the South Bay surf sound, and this has some of those elements in it. Cannonball Adderley's jazz classic, played with the Jim Waller and The Deltas's characteristic lounge exotica luau ethic. Great! This is the next best thing to Tommy Nunes' original, and totally different. It's glorious jazz chords and tones make it ever so exotic. Thgis just may be the most original cover, and it sure rates a billion stars. Completely enchanting! Relatively straight surf arrangement for Waller's band, this cover of an early Central Coast standard from the Revels is solid and very cool. The organ pumps out the feel of the surf with a cool backtrack. The guitar and sax trade off against the organ. Great jazzy whammy chords give it ab aquatic edge. A jazz arrangement of the Beach Boys classic first record. Unusual, and enjoyable. 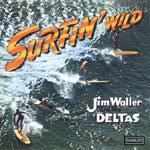 Another Waller original surf/jazz tune with real hole-in-the-wall soul. The oft-covered surf tune, done with heavy horn and organ use, and a Latin jazz feel. Different, and cool. The vision of the waves at Waikiki as seen over the rim of a glass bearing an umbrella and some beverage comes to mind here. A very soulful luau number that gets you going even if you want to hate it. Great schmoozy stuff.